If you missed Part 1 “pre-trip” you might want to read that one first here. Although you won’t be completely lost if you dive right in now. It’s amazing what an airplane ride alone for pleasure can do to ones soul. Scratch that. I don’t think you need an airplane ride. Good Food. A little wine if you like. Laughter. And toss in a few people in your circle of love (or people that might become part of that circle). And in times of true “desperation”, you need it lumped up together for at least 48 hours. But more time may be required. It depends on how intune you are to your body, to your mind and how it connects. I’m pretty good at it. Others may need weeks, months, years. As long as you start noticing the connection, I won’t worry about you. A smart, loving friend who was unable to make this trip in a brief Marco Polo message reminded me to Relax. Not fill this vacation with the constant flow of motion I typically spend all my time doing. Just like my calendar at home, my vacation calendar is usually jammed packed too. There’s just so much good stuff to do!! Places to go. Things to escape from at home. Inner thoughts to squash. So with this trip I tried to set an Intention, a prayer to settle my mind and my heart and to discover as I wrote about in my pre trip post MY PURPOSE. Reflecting back on this thought only a mere 4 days earlier makes me roll my eyes and chuckle. Talk about the opposite of relaxing! I set the intention to find my LIFE’s PURPOSE in an 80 hour escapade across the country while purposely ESCAPING life and all the responsibilities that go with it?? Ummm, Does anyone else see the irony in this? Or better yet the idiocy of it? I essentially almost ruined a fabulous trip away putting so much effort into finding what I referred to last week as my Zone, what makes me feel Alive, HAPPY. It was on day 2 of a Hot Yoga class that something shifted. Actually it started first with a question my friends mother in law asked “what brought you out here? Was it just for a visit? I provided her the edited, humorous version of my story: that I was escaping life, having a final hurrah before adding more work hours at the hospital and trying to make my hubby feel some of the grunt work I did on the regular (although he did reply prior to the trip it was taking 3 adults to fill the void of just this one mom…Thank You to my mom and dad for stepping in). What I didn’t tell her was that my closet, sacred home of my hidden jelly bean stash from 2016 and YouTube watching exercise regimens was also becoming my oasis for tears of feeling inadequate. To feeling unaccomplished. To feeling lost. Without Purpose. Mediocre. You see when I talk about Big, Bold my lifes PURPOSE, I’m referring to wanting to Save the Whales, start an Orphanage, Cure Cancer, Eliminate Common Core Math. Not the I was put on this Earth to become a mom, a good person, a funny friend. I was Phinius Barnum in The Greatest Showman. Was what I’ve already accomplished ever going to be enough? And that’s when it hit me. On a yoga mat. Dripping sweat. Only being able to concentrate on moving my body. I had fallen in the comparison trap. I wasn’t looking for Purpose. I was looking for recognition. Accolades. The story written about me, but not BY ME. And instead of comparing myself to FB friends traveling the globe (which if you follow me on FB, I have an addiction to travel) I’ve been comparing myself to stories from NPR about 19 year olds starting Tibetan orphanages. 50 year old woman starting mega successful indoor cycling companies and selling them for crazy money. And those that are bright enough to hit the TED talk stage. I was confusing these stories of INSPIRATION with PURPOSE. And the further I thought about these revolving moments of idequacy and tears, the more I realized they happen when I overbook my schedule. When I become a hamster in a clear ball knocking into walls and furniture. Oh I’m not stuck on the proverbial hamster wheel. I’m moving just fine but with no finite destination. And I realize this constant wall knocking is when I breakdown. And it comes down to this: When do I feel Alive? In the Zone? HAPPY? When I allow the QUIET. Slow down and enjoy nourishing FOOD. MOVE my body with PURPOSE. Feel FRESH AIR on my face. And LAUGH, talk and share in the glory of family and friends. Unrushed. No agenda. Uncluttered. And that you don’t need a airplane ride for. Although I must admit until I figure out how to harness all of this, it does help. ps. 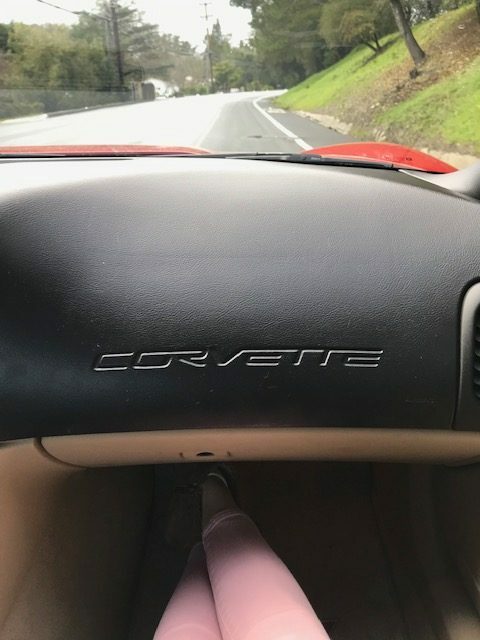 Yep, that’s me chilling in my friends inherited Red Corvette. Earlier we drove in her Tesla. Now if those 2 ying and yang moments don’t provide for some kind of fantastic metaphor, not sure what does. Stay tuned.